Arsenal’s dismal away form continued on Sunday with a defeat at Newcastle United, and Martin Keown has stuck the boot in on defender Shkodran Mustafi. The Gunners slipped to a 2-1 defeat at the weekend as they continue to struggle domestically, with their hopes of qualifying for the Champions League all now hinging on their ability to progress in the Europa League. In order to do that, they’ll need to be much better defensively away from home when they face Atletico Madrid in the semi-finals later this month, but Keown has raised concerns he has with Mustafi’s inability to learn from his mistakes and be better in the heart of the Arsenal defence. 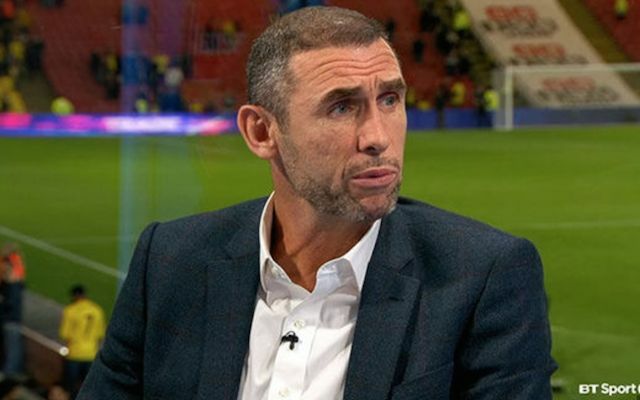 The BBC Sport and BT Sport pundit knows all about what it takes to be a defensive rock at Arsenal having been a key figure in their success between 1993 and 2004, so he’s well placed to offer criticism and advice. “Mustafi seems to still be making the same mistakes he made earlier this season,” Keown said on MOTD2, as reported by The Mirror. Mustafi, 25, is a highly experienced defender and a World Cup winner, and so it’s fair to suggest that Arsenal expect much better from him to lead them at the back and ensure that they are defensively sound. However, he hasn’t been able to live up to expectations, and that in turn has had a negative impact on the Gunners who simply haven’t been good enough in that department which has led to their struggles in the Premier League and specifically away from home. Having conceded 45 goals in 33 games, they’ve got the worst defensive record of the top seven sides, and so if they harbour ambitions of advancing past Atleti and getting to the Europa League final, they’ll have to defend much better when they travel to the Wanda Metropolitano on May 3.